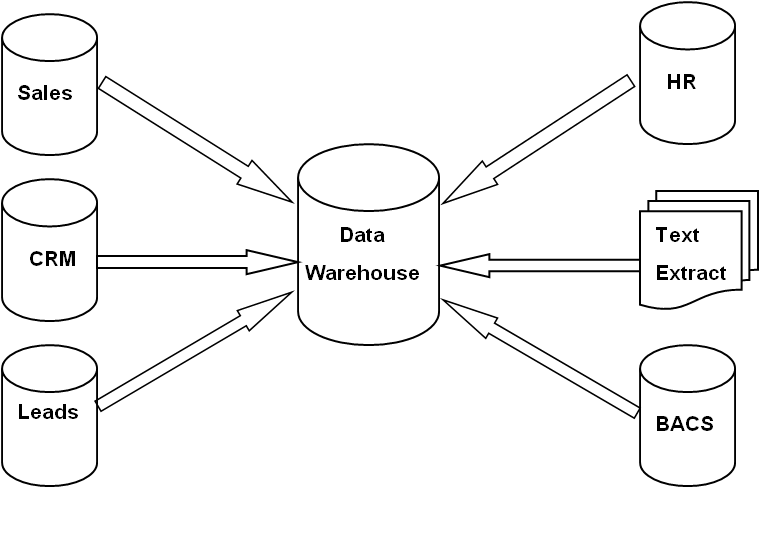 “A data warehouse is simply a single database which brings together data from different operational database systems which could be on different database platforms. Data warehouse data sources can include large text file extracts rather than a database. Sample data sources – Customer data in sales, CRM, Leads, BACS, Telephony systems. A data warehouse should not be used as a consolidation tool back to the operational system. Data does not equal information that is of use to your business. Do any of these phrases sound familiar in your organisation? The contents of the data warehouse must be understandable. Data has to be intuitive and obvious to the business user. Usually accessed with a user friendly web interface. Typically a BI application. Data must be carefully assembled from a variety of sources around the organization, cleansed, quality assured, and released only when it is fit for user consumption. Information from one business process should match with information from another. If two performance measures have the same name, then they must mean the same thing. Conversely, if two measures don’t mean the same thing, then they should be labeled differently. Consistent information means high-quality information. Organizational change is inevitable over time. Changes to user needs, business conditions, data, and technology. The data warehouse must be designed to handle this inevitable change. Changes to the data warehouse should be graceful, meaning that they don’t invalidate existing data or applications. The existing data and applications should not be changed or disrupted when the business community asks new questions or new data is added to the warehouse. A Data Warehouse is a huge asset which will include sensitive information on company performance. Information you don’t want competitors to see. Data access must also be restricted within an organization so that each user is only allowed to see what you want them to see. The data warehouse must have the right data in it to support decision making. There is only one true output from a data warehouse: the decisions that are made after the data warehouse has presented its evidence. If the business community has not embraced the data warehouse and continued to use it actively six months after training, then is has failed the acceptance test. Data collected to handle an organization’s ongoing business. E.g. Daily transactions or invoices. Call stats. Data collected, organized and made available for analysis. E.g. Aggregated sales information by day, week, month, quarter, year, financial year. Split by division, region, team. Analyze by product line. Operational reports are typically scripts or reporting tools which run queries directly on an operational database. The database running a business application. Typically daily reports showing what has happened today or yesterday. Results of these reports are usually exported to Excel spreadsheets creating Excel empires. On the otherhand, a properly designed data warehouse and BI solution provides a consistent, summarized archive of data on company performance. It exists on it’s own independent database therefore not affecting operational database performance. Reports show the latest data up to the point when the report is executed. Reports are slow if trying to select a large amount of data. Your transactional databases are not configured to return large amounts of due to database settings and the underlying structure of how data is held. Transactional databases configured specifically to run the application efficiently. Requires expert knowledge of the database and the SQL query language which means your Management Information (MI) reporting relies on a select few. No ad-hoc reporting capability. The data is volatile and constantly changing. Report results may differ day to day. Reports held and maintained by a small number of people, resource intensive, not easy to access reports, prone to human error. A simple design therefore easy to understand and queries execute faster. Makes company data much more accessible using BI tools. Presents a single consistent view of company data. Single definition of company metrics and KPIs. No impact on the operational database which runs your business. Report execution much faster. Quickly create ad-hoc reports with no specialist knowledge or reliance on IT professionals. Easy user access to information. Superior insight into your business. Easily spot trends for improved decision making leading to more advanced competitive capabilities. Looking for assistance in your Data Warehouse project using Oracle technologies? Contact Us. Alabra Consulting with over 10 years experience developing ETL routines for the Oracle DBMS.